Lauralyn Dickerson (left) smiles as she accepts the Safety Management Award from Dr. Charles Thomas, chairman of the Process Technology Division, at the 2017 Lee College Presidential Honors Day held Tuesday, April 11, 2017. The annual event recognizes the top students in every Academic Studies and Applied Sciences discipline at the college. BAYTOWN, TX — As Lee College prepares for the end of the semester and the 2017 Spring Commencement Ceremony, dozens of the best and brightest students received awards and recognition for achieving excellence this year in academic programs and extracurricular activities. 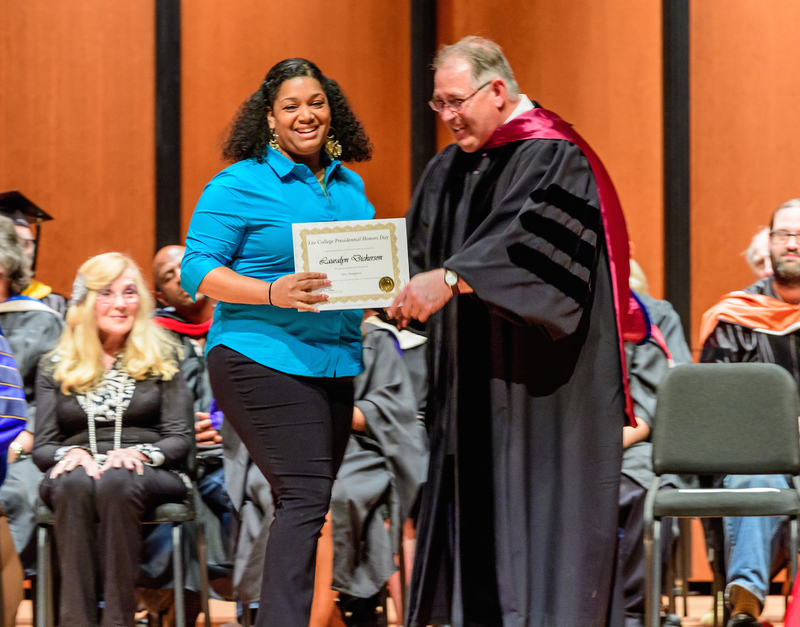 At the annual Presidential Honors Day in the Performing Arts Center, top students in every Academic Studies and Applied Sciences discipline were called on stage one by one to receive plaques and certificates. Faculty members selected many of the honorees for their outstanding grades and performance in the classroom or laboratory, mastery of key course concepts and skills and display of intellectual curiosity and growth. Others were chosen for having a strong work ethic and enthusiasm for subject matter, helping and encouraging their classmates and being persistent in overcoming obstacles to reach success. The first-ever Presidential Recognition Luncheon in the Rundell Hall Conference Center complemented the traditional Honors Day ceremony, celebrating students for high achievement in co-curricular and extracurricular activities – from presenting original research at academic conferences, to performing in a national theatre festival and playing well on the basketball and volleyball courts. Students received medallions and certificates for winning campus, district, regional, state and national awards and scholarships through participation in the Honors Program, Webb Historical Society, Mendoza Debate Society, Model United Nations, Visual and Performing Arts, Athletics and Service Learning. 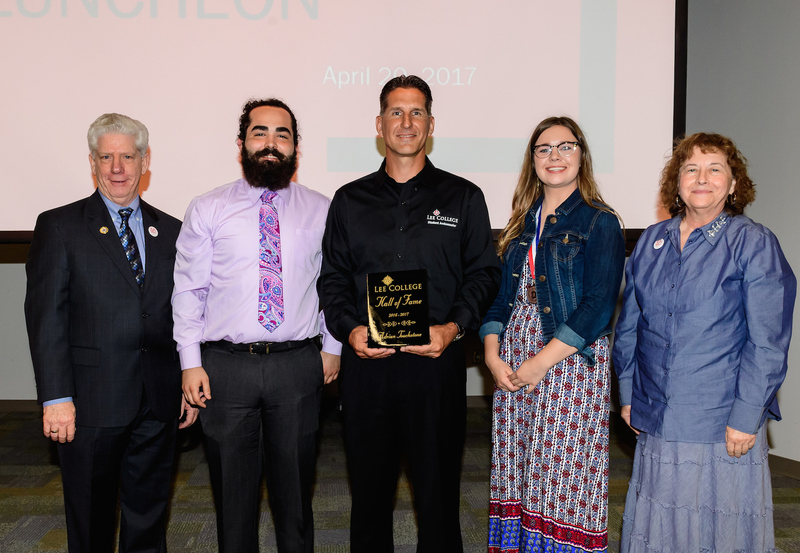 New inductees into the Lee College Hall of Fame were honored at the first-ever Presidential Recognition Luncheon, held Thursday, April 20, 2017, to celebrate student success in co-curricular and extracurricular activities. Pictured (l-r): Pres. Dr. Dennis Brown; Hall of Fame inductees Justin Mathews, Adrian Touchstone and Brenna Sallee; and Vice Pres. of Student Affairs Dr. Donnetta Suchon. Not pictured: Hall of Fame inductees JaVonte Cooper and Cynthia Rose Pizana. The five newest inductees into the Lee College Hall of Fame were recognized at both Honors Day and the Recognition Luncheon: JaVonte Cooper; Justin Mathews; Cynthia Rose Pizana; Brenna Sallee, who was named Most Representative; and Adrian Touchstone. Hall of Fame honorees are the students who best represent academic excellence, extracurricular involvement, campus leadership and dedication to community service. 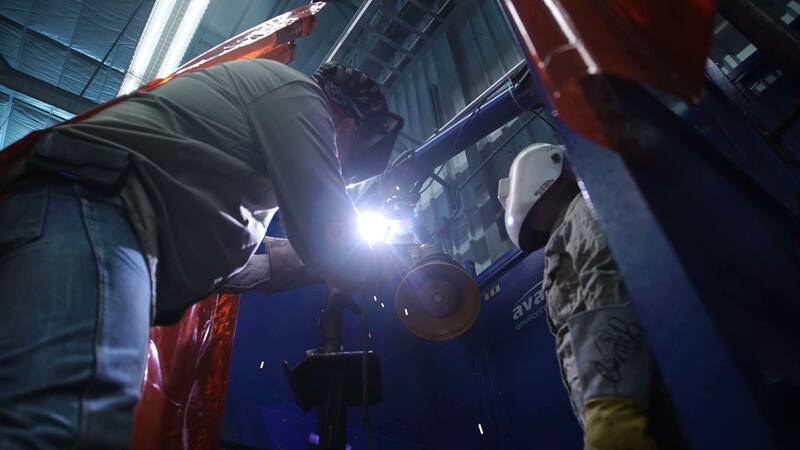 Industrial Welding Technology is one of five degree program options that students can choose from in the Weekend College at Lee College, which is hosting a free information session on Thursday, Feb. 23, 2017, in the Rundell Hall Conference Center on campus. 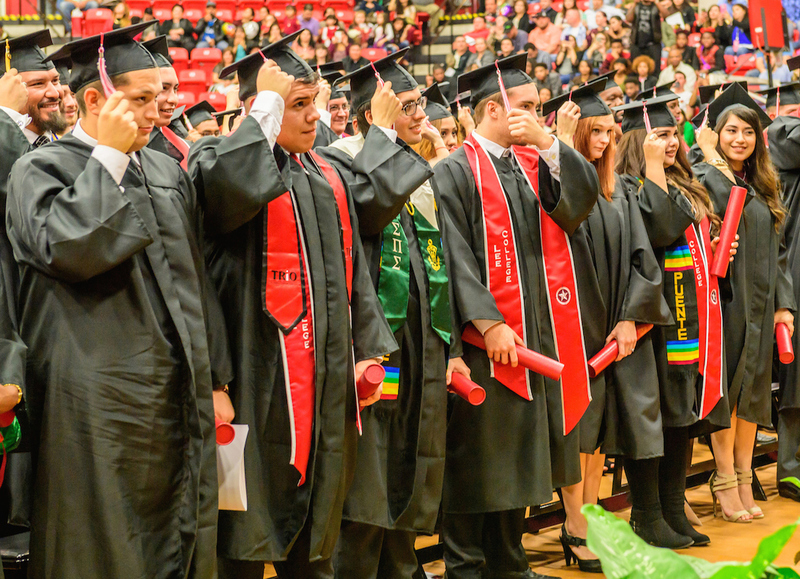 Additional program options include General Studies Transfer degrees in Allied Health and Social Science Concentration, Business Administration and Management and Computer and Network Maintenance Technology. BAYTOWN, TX — As a mother of four working full time to support her family, Raquel Velazquez didn’t think she would ever be able to go back to school and earn the college degree she always wanted. Then she learned about the Weekend College at Lee College. Through the Weekend College, students earn associate’s degrees in less than 2 years by attending classes only on Friday evenings and Saturdays. Funded through a $2.7 million grant from the U.S. Department of Education, the program caters to adult learners and others who want to advance their careers but have to juggle school with work and other responsibilities. The first of several free information sessions for prospective Weekend College students will be held from 7-8:30 p.m., Thursday, Feb. 23, in the Rundell Hall Conference Center on campus. Participants will hear from faculty, staff and current students about the five different program options – General Studies -Transfer in Allied Health, General Studies – Social Science Concentration, Business Administration and Management, Industrial Welding Technology and Computer and Network Maintenance Technology – and learn how to enroll in the program for the Fall 2017 semester. Information will be available in both English and Spanish, and refreshments will be provided. Additional information sessions will be held March 4, April 13, May 21, June 10, July 18 and Aug. 2. “It sounded like it was going to work for me,” said Velazquez, who picked up a flyer about the Weekend College while helping her daughter register for classes. She entered the program just as her son and daughter were getting started at Lee College and will be the first of them to graduate, earning an Associate of Applied Science degree in Business Administration and Management in May. Of the first cohort of students to enroll in the Weekend College in Fall 2015, fully 65 percent are expected to complete their degree programs within three years or less – significantly more than the state average of 12 percent. Grant director Victoria Marron attributes the high success rate to the unique design of the Weekend College program. The same groups of 18-25 students are kept together from enrollment to graduation or transfer. Courses are offered at multiple Lee College locations to make them more convenient, and many are delivered in a hybrid format that blends online and classroom instruction. Block scheduling ensures students know exactly which courses to take and when they will be held, and Weekend College courses are never dropped or filled to capacity. Once accepted into the program, students will always have the classes they need for their degree. Weekend College students work with a completion coach who helps them apply for the program, secure financial aid and conquer any challenges that arise while they are enrolled in school and even after graduation. They also receive personalized advising, financial assistance and round-the-clock tutoring as needed. Initially “terrified” to return to school and unsure how she would make time for everything on her lengthy to-do list, Velazquez said she now encourages others to consider the Weekend College. Having guaranteed classes and a cohort of classmates with whom she has forged strong connections make completing the program easier than she expected. For more details about the Weekend College at Lee College or the upcoming information sessions, contact Completion Coach Jessica Falla at 281.425.6421 or Outreach and Recruitment Specialist Sharon Guillory at 832.556.5776, or visit www.lee.edu/weekend. BAYTOWN, TX — With their family and friends filling every seat of the Sports Arena, more than 250 graduates crossed the stage at the Lee College Fall 2016 Commencement ceremony to receive their associate degrees and certificates of completion. More than 250 graduates participated in the Lee College 2016 Fall Commencement, held Friday, Dec. 16, 2016, in the Sports Arena on campus. The ceremony was also streamed live online. As she praised the graduates’ hard work to achieve their dreams, keynote speaker and Texas State Sen. Sylvia Garcia shared two of her earliest aspirations. The eighth of 10 children born and raised in the small South Texas farming community of Palito Blanco, Garcia first wanted to someday work inside an air-conditioned building rather than outside in sun-scorched fields. Second, she wanted to make sure children in need of medical care would not have to stand in line to receive shots, as she and other poor youth from Palito Blanco did. Garcia’s parents assured her that if she worked hard, got an education and kept her belief in God, she could reach any goal she set for her future. After earning a bachelor’s degree in social work from Texas Woman’s University and receiving a Juris Doctor degree from the Thurgood Marshall School of Law at Texas Southern University, the former social worker and longtime public servant realized they were right. A degree is the one thing in life that no one can give you or take away, she said, and the key to opening many doors and possibilities. “No matter who you are or where you come from, tonight you’re all very equal because that’s the beauty of education: it’s the great equalizer for all Americans,” Garcia said, acknowledging that many Lee College students likely had to juggle their studies with a job, family and other responsibilities. 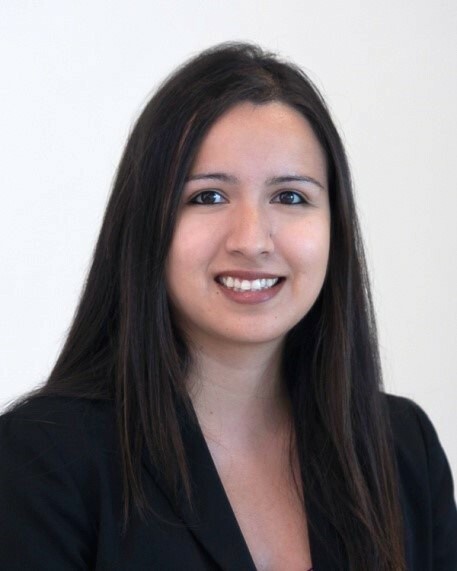 Though she was elected controller for the city of Houston, became the first Hispanic and first woman to be elected in her own right to the Harris County Commissioners Court and has represented District 6 in the Texas State Senate since 2013, Garcia told graduates that her first two election campaigns were failures. Success and failure are temporary and neither is a reason to grow complacent or discouraged, she said. The message resonated with graduate Stephen Shea, a U.S. Navy veteran who moved to Baytown from Gardiner, Maine, to attend Lee College and pursue a new career in the petrochemical field. A former butcher who was looking for an affordable education that would fully prepare him for work in the industry, he earned an Associate of Applied Science degree in process technology and feels confident about his ability to find a job and hit the ground running. BAYTOWN, TX — A new course debuting this fall at Lee College will give students the chance to learn the fundamentals of physical science by exploring well-known movies, television shows and stories of science fiction — from “Star Wars” to “Interstellar,” “X-Men,” “Back to the Future” and more. Sci Fi Physics is an introductory class designed for students who are not majoring in technical fields, but need a science elective to complete their Lee College degree or certificate. Evan Richards, Ph.D., instructor of physics and pre-engineering, will teach the course on Monday and Wednesday afternoons. While many science classes involve heavy analysis and multiple mathematical equations, Sci Fi Physics will focus instead on exposing students to major concepts of physical science in a way that is more exciting, engaging and relevant to their daily lives and interests. Material from science fiction movies, television shows and short stories will be used as the launching pad for more in-depth examinations of basic physical science principles. “Science fiction fascinates people and physical science has a lot to say about that,” said Richards, who often reflects on his own expertise in physics and engineering when evaluating the validity of scientific ideas highlighted in popular culture. He looks forward to helping students link and compare Hollywood’s version of physical science — like invisibility and time travel — with real concepts and ideas. Registration for Sci Fi Physics and other fall 2016 classes at Lee College is ongoing. For more information about the course, search for “PHYS 1415 – F02A” in the online course catalog at catalog.lee.edu or contact Richards at erichards@lee.edu.